The countdown is on for Southport’s new £20 million state of the art mental health facility to be named Hartley Hospital and fully operational in a year’s time. The name recognises the historic origins of its location on the former Southport General Infirmary site next to what used to be the Christiana Hartley Maternity Hospital. The late Christiana Hartley CBE, one of the famous Hartley jam-making family, went on to become Southport’s first woman Mayor in 1921 and was an advocate for better health services, education, women’s equality and champion for children and the poor. Mersey Care NHS Foundation Trust chose the name Hartley Hospital after consultation with its staff, service users and carers and the wider community. The hospital’s internal areas will reflect names that connect it to the Sefton coastline, including Dunes Ward, Marsh Ward, Mere Suite and Marine Suite. Chief Executive of Mersey Care, Joe Rafferty said: “Hartley Hospital will provide the best standards of accommodation and therapeutic environments within our resources – it is a statement of our commitment to deliver on promises for better mental health services in Sefton. Construction on the site, situated off Scarisbrick New Road, Southport, started just over a year ago. Phase One of Hartley Hospital is due to open this autumn to enable the existing Boothroyd older people’s service to move in, before demolition work of the remaining old buildings. Final completion will be by January 2020, when services will start to relocate from the nearby Hesketh Centre. Names for the new hospital and its wards came from visitors to road-shows in The Atkinson, Life Rooms Southport, Hesketh Centre, Boothroyd Unit, Trust’s Members’ Meeting at Aintree Racecourse, as well as Southport and Formby Clinical Commissioning Group’s Big Chat at the Royal Clifton Hotel. Hundreds of suggestions including on-line and face-to-face questionnaires were whittled down by a group made up of staff, service users, carers and local volunteers before the Project Board, led by Chairman Beatrice Fraenkel, made a final decision. The new building will contain a café, family visiting room, multi-faith area, internal garden courtyards. All patient bedrooms will be single with en suite bathrooms and there will be a number of therapy and activity areas including two gyms. 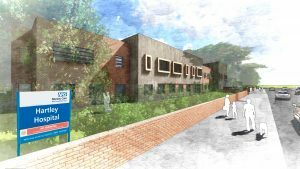 Hartley Hospital will provide two 20-bed wards, one for adults the other for older inpatients, needing short-term mental health care and treatment, as well as an assessment suite (specifically for people needing a place of safety and assessment under Section 136 of the Mental Health Act). A range of community services and outpatient clinics will also be co-located there for the first time. Aquathlon heads back to Southport! Suspected stolen property found in Hightown - Is this yours?